CHICAGO BLUES REUNION is a collaboration of Chicago music legends who defined the sound of their generation in the 1960′s – and helped create the historic transition in popular music from acoustic folk to electric blues-influenced rock. A who’s who of blues lovers’ household names, Chicago Blues Reunion members include Barry Goldberg, Nick “The Greek” Gravenites, Harvey “The Snake” Mandel, Corky Siegel, with backing by a band of top flight pros including Gary Mallaber and Rick Reed. In the early 1960′s, a small group of white teenage musicians fell in love with the blues. Barry Goldberg (Hammond B-3), Nick “The Greek” Gravenites (vocals/guitar), Harvey “The Snake” Mandel (guitar) and Corky Siegel (harmonica/vocals) were drawn to the small clubs in the city’s toughest neighborhoods, where Muddy Waters, Howlin’ Wolf, Little Walter and others held court nightly. These young musicians were accepted and mentored by their larger-than-life heroes, and over the last 50 years have gone on to bring the blues – in its traditional form and in the new ones they created from it – to audiences worldwide. 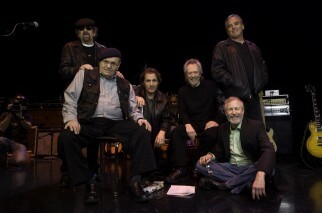 In the late 60′s, as each of these musicians went on individually to bring the blues to the rest of the country, as they exploded on the music scene as solo artists and in groups like The Electric Flag, Goldberg Miller Blues Band, Siegel-Schwall Band, Canned Heat, Charlie Musselwhite’s South Side Band, and John Mayall and the Bluesbreakers. All their paths zigzagged from the major rock palaces like the Fillmore, and festivals like Woodstock, Monterey, and Newport, they ran parallel, then crossed again. The spark they struck all those years ago always stayed lit, whatever they did, wherever they went. Muddy Waters, Howlin Wolf and Little Walter are all gone. Now Barry, Nick, Harvey and Corky, who once learned lessons at the feet of the blues masters, are the tribal elders. Now they are the ones with years of experience, stories to tell, and wisdom to impart – and on whose shoulders blues stand. Today, they’ve joined forces as Chicago Blues Reunion, an all-star collaboration of Chicago music legends who defined the sound of their generation in the 1960′s.